Relive your childhood - Great for any occasion and sure to create a superb fun theme to your event. Equally good for those who prefer a fierce, but exciting battle or for to achieve a specific objective. 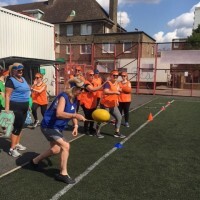 Whether it's a children's party or an event for adults, a sports day event has it all! Great for any occasion and sure to create a superb fun theme to your event. Equally good for those who prefer a fierce, but exciting battle or for to achieve a specific objective. Running races - any running race you can think of, from a 50 metre sprint, to a 5k endurance race or a steeplechase! Egg & spoon - either standard size or giant egg & spoon race. Sack race - hop your way to the finish line in this classic. 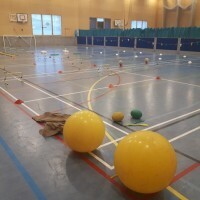 Space hopper race - a great idea to add some extra fun to your day. Standard size for the kids and the giant version for adults. Hockey/Football slalom - excellent for fine tuning your ball control. Hula Hoop Race - you don't have to be good at hula hooping to win this. Bean Bag Race - this one is all about balance... and technique. Hurdles - jump over hurdles quickly, simple but great fun! Javelin - it's a battle of length. Throw them as far as you can. Tug of war - one of the best team events going, it's guaranteed to generate excitement! Skipping Race - taking you right back to school, it's all about stamina. Football/Netball Target Shooting - Can you keep your nerve under pressure? Team challenges/games - any form of team based activity, including relays and other team sports. How long does it last? Sports day events last between 1-2 hours, depending on group size. How many activities will you take part in? It all depends on your group size and the event structure you require. Normally, a sports day will include around 10 activities. Where do we run it? Anywhere in the UK. This is a completely mobile event and we will travel anywhere! Usually in sports halls or on all-weather pitches.